At our first wedding of the year, we had the chance to see the Unbooth in action. The Unbooth by Kris + Jes of Clewell Photography definitely puts a fun new twist on photo booths! It offers guests fun, creative, and professional photos with a click of a button. The Unbooth is giving away a complimentary three-hour rental that will include props and a disk of images for the best backdrop idea! 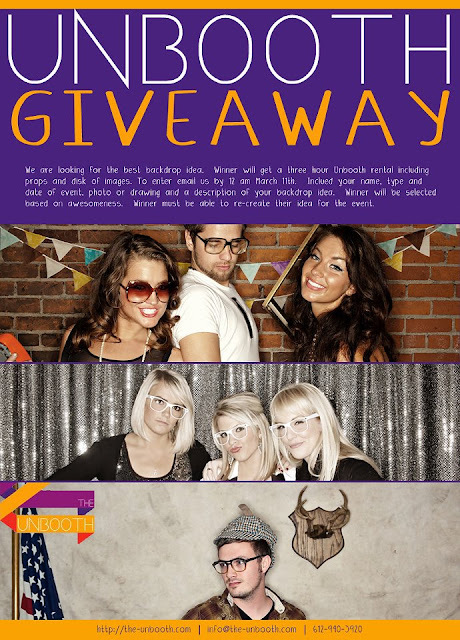 Email info@the-unbooth.com with your name, type of event, date of event, photo or drawing along with a description of your backdrop idea by 12am Sunday March 11th. Winner will be selected based on awesomeness. Winner must be able to re-create their idea for the event. Marriage is the most prominent and most important day in everyone's life our photo booth is the best option for preserving all those joyful moments. Become our member today to know more about us.